Wow! Now this is a royal look for girls this Spring Summer 2016 – a girls stunning gold brocade cape by Dolce & Gabbana Girls with a white, real fur trim around the collar and hem adding a luxurious touch. Inspired by the Dolce & Gabbana Women's Spring Summer 2016 Collection – it's made from a softly textured fabric, woven with gold and rose gold metallic thread in a raised leaf pattern and beautifully lined in a satin feel lining. The most luxurious piece of the Dolce & Gabbana Girls Starry Night Collection. 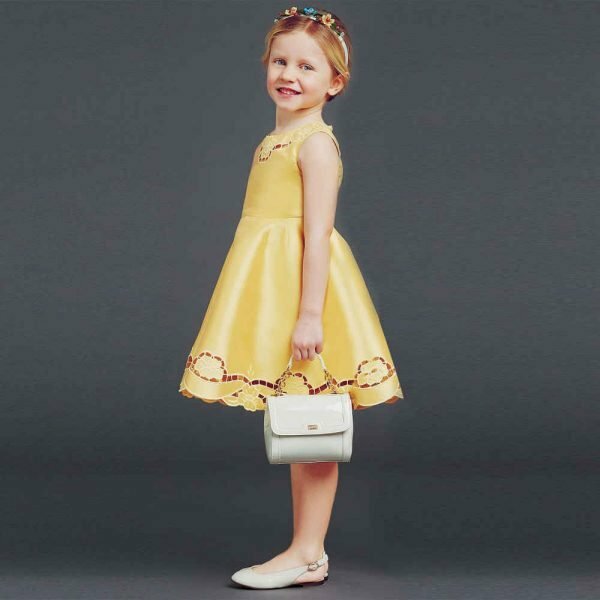 Complete the look with a matching dress, shoes and headband. Designed in Italy by the famous D&G Fashion House. Ships Worldwide.